After ordering the myvu glasses a couple of weeks ago, I thought it would be nice to see how they worked with a portable media player. Â Since we had an Apple ITouch, I figured I would try out the Microsoft Zune for a change. Â Over the last few months I have heard good things about the Zune as an MP3 and Video Player. Â I know it lacks the features of the Apple ITouch, but it compares well with the Classic Ipod. Â Which means no touch screen and a hard drive not flash memory. I had mine specially made and engraved from Â Zune Originals, based on recommendations from Zune fans. 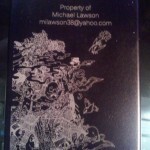 Â The picture in this article is the engraving I picked on the back of the Zune. Â Pretty neat if you ask me, it was weird seeing the Fedex shipping progress as it shipped directly from China. Â I paid the extra shipping charge and it arrived at my door within a week. Â When ordere from Zune Originals the package includes the premium earbuds. Â While I know I could of ordered a plain version at Amazon or even gone and picked one up at Walmart, I wanted to try something a little differant. I must say I like the Zune software a lot better than Itunes, and the Zune market place is really easy to figure out and find what you need. Â Since my PC is running 64 bit Vista I had to download a differant version, but so far it has performed well. Â I highly recommend trying the Zune Pass free trial, this allows you to download any song you want from the marketplace and keep it as long as you continue the subscription. Â After that it is $14.99/month but includes 10 free song downloads per month that you get to keep, so if you are going to buy that many in a month it is well worth it. The Zune 120 contains a 120GB drive so as I mentioned above it is not a flash memory player it has a hard drive. Â Occasionally when synching I have heard it but no noise comes through while listening with the earbuds. Â The sound quality appears to be slightly better on the Zune than on the ITouch or on my Nano. Â One thing I like is that I can easily download my recorded shows from Media Center directly through the Zune software, although it must go through a conversion first. Â The Video quality is very good indoors, and while I have tried the myvu glasses once I need to do more testing to let you know what I think. Synching a device with 120GB can take a long time, but currently I only have about 10GB on it so that goes quickly. Â The Zune can also be setup for wireless synchronization to your PC, I don’t think I would want to use that feature if I was loading videos. Â One issue that is noted in various blogs is the usual problem Microsoft has with counting, the status on the Zune and PC software can be differant and sometimes seems to stop on the Zune. Â This is a known issue, and they suggest that you believe the Zune. Â Otherwise synchronization is a breeze. One of the biggest issues I have had with Apple is playlists I just can’t either seem to come up with good ones or they get messed up. Â The Zune marketplace has lists that are updated as well as channels, this makes it easy to get music you like onto the Zune. Â Podcasts are done the same way, while Videos you will still have to shell out some cash even if you have a Zune Pass. Â The Zune also has a social networking feature, but I think I have to find someone else I know with one to utilize it. Â Afew games exist for the Zune and I downloaded them with the latest patch, but so far there is nothing like an app store that I can find on the market place. One nice touch is that the Zune has a FM Radio built in, with a feature that lets you add a song you hear to your shopping cart. Â All in all I am glad I picked one of these up, I hadn’t bought one before because I thought it would be a poor imitation of an Ipod. Â I think Microsoft has a great product here one worth considering if you want to get ITunes off your PC like me or just want to try something differant. Â I think the Zune Pass is an essential element if you listen to a lot of newer music, but you can always buy music without it. Â Anyway I will update this blog with newer information as I play with it some more.